Future Market Insights’ comprehensively consolidated report on pharmaceutical packaging market represents high market fragmentation, with key players in the pharmaceutical packaging market including Amcor Limited, Ardagh Group SA, Schott AG, and Klockner Pentaplast Group among other companies accounting for a combined share of less than 22% in 2017. Pharmaceutical packaging market fragmentation at the base of the competitive pyramid is dominated by a number of smaller companies focusing on specific aspects of the value chain—from primary packaging including HDPE bottles, blister packaging, ampoules to secondary pharmaceutical packaging including pouches, cartons, and labels—translating into no significant differentiation offered by smaller companies. FMI predicts relatively high competition in the pharmaceutical packaging market, owing to steady rise in the number of small- and medium-sized players, specifically in key pharmaceutical consuming countries such as China and India. Owing to shifting regulatory landscape in the pharmaceutical packaging market, consumer demands too, have been evolving. Regulations including the Affordable Care Act (ACA), allowing millions of Americans to obtain insurance coupled with aging population, disease prevalence, competition from generics manufacturers, and affordability has resulted in an increased global demand for pharmaceuticals and personalized medicines, paving way for more avenues in pharmaceutical packaging market. As more and more patients demand customized treatment, key stakeholders in the pharmaceutical packaging market are projected to shift their focus to more localized and continuous production of customized medication in the coming years. This is likely to result in companies operating in pharmaceutical packaging market handling smaller batches with shorter lead times, further translating into more efficient distribution of medications. Contract packaging, postponement packaging, and serialization are three major trends projected to transform the pharmaceutical packaging landscape, with a significant impact on the supply chain moving forward. Given the complexity of pharmaceutical packaging requirements owing to the increasing number of pharmaceutical innovations coupled with introduction of stringent regulations including the Drug Supply Chain Safety Act (DSCSA) and EU’s Falsified Medicines Directive (FMD), contract pharmaceutical packaging is projected to play a crucial role in the overall pharmaceutical manufacturing and packaging landscape. However, contract packaging could result in significant product waste and high inventory costs paving way for postponement pharmaceutical packaging or late-stage customizations, wherein centrally-stored blanket product components including boxes and blister packs are customized for specific markets. Postponement packaging is projected to open new avenues for patient-specific pharmaceutical packaging and contract packaging organizations (CPOs) already equipped with late-stage customization packaging. Serialization is pegged have the most impact on pharmaceutical packaging landscape owing to an increasing number of counterfeit medicines circulating, globally—the reason behind regulations like DSCSA and EU FMD, making it important for each product to have a unique serial number. For the companies involved in pharmaceutical packaging, aggregation process—involving scanning of salable units to understand the nature of the other contents—is likely to facilitate efficient material handling translating into efficient supply chain. In addition to barcodes, key players in the pharmaceutical packaging are increasingly using radio frequency identification (RFID) and near field communication (NFC) tags as a part of their labeling process, for a more efficient product identification and patient engagement. Moreover, labeling technologies like RFID and NFD tags would digitally transform the pharmaceutical packaging market, translating into more efficient data management and data exchange systems. NFC-enabled labels would help companies to communicate critical information to consumers, resulting in better medication adoption. Additionally, regulations including FDA’s current Good Manufacturing Principles (cGMPs) and ISO 13485, would ensure highest quality pharmaceutical packaging, in the coming years. In the global pharmaceutical packaging market, FMI predicts aggressive mergers and acquisition deals between key companies —to bring in new innovations and realign their portfolios. In August 2018, Amcor Limited, a key player in the pharmaceutical packaging market acquired Bemis Company to create a global leader in consumer packaging. Through this collaboration, key companies in the pharmaceutical packaging market are likely to capture more sustainable packaging opportunities and expand R&D capabilities. Moreover, Amcor’s acquisition in China and India—Hebei Qite Packaging Co. and Packaging India Private Limited) reflects Amcor’s strategy to acquire major flexible packaging players in emerging economies. Another key participant in the global pharmaceutical packaging market, Berry Global, in 2017, acquired Clopay Plastic Products Company—a global supplier of printed breathable films. Klockner Pentaplast Group, too is focused on acquisitions in order to expand its presence in pharmaceutical sector. Catalent acquired Accucaps Industries Limited to expand its pharmaceutical product portfolio, in 2017. Click here for more insights on the competitive landscape in the global pharmaceutical packaging market. A new research presents all sorts of information that you need to know about global pharmaceutical packaging market. It is an initiative to analyze the global pharmaceutical packaging market, on the basis of trends following the market, drivers driving the growth of market, restraints that are limiting the growth of market, and opportunities available to the key players of the market. The report is structured in a way that it maintains a smooth flow and gives an understanding about every aspect of the market. It starts with the basic definition of the market, followed by a taxonomy of the market. The market taxonomy bifurcates the market into various divisions that simplifies the market study and research. 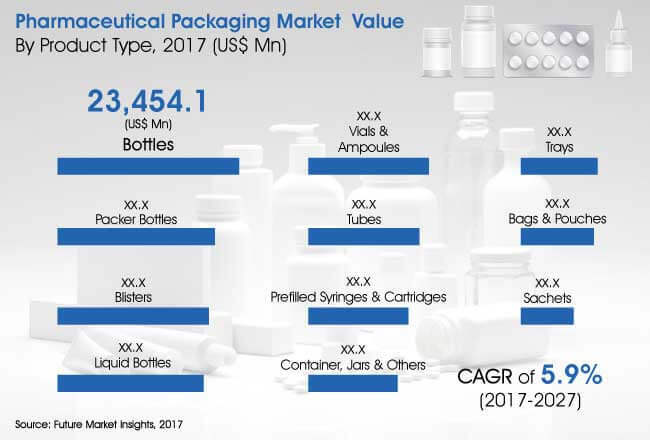 The report also includes a competitive landscape that gives a brief profile of all the major players of the global pharmaceutical packaging market. It offers support to all businesses currently operating in the market and also to the new entrants to make a counter strategy in order to compete effectively in the ever changing dynamics of the market. The report follows a systematic research methodology for its extensive research reports. The process initiates with an in-depth primary and secondary report that helps in curative information like market size, segments, and trends on the broad basis and also identifying key market players. After the main data is collected, to get a conclusion on different points, major industry leaders and analysts are interviewed who helps in getting accurate information about the market and also give the right kind of touch and feel to the research . All the information that is gathered in the report, is then validated with the help of a triangulation method wherein primary, secondary and FMI contributes to the final data. This data is also converted in the form of charts and graphs to make it easy to grasp and attractive to the readers. It is given a ready-to-use format, so that it saves the time and labor of a lot of people who are looking to expand their business in an industry. The report gives them a descriptive analysis of the areas that have the maximum potential which will help them grow. The market research report on pharmaceutical packaging market offers many reasons for investing in the report. The exhaustive research report on pharmaceutical packaging gives all the guidelines essential to take the product from the conceptualization to commercialization stage and a feel of the future by presenting thoughts on the future scenario using an effective forecasting model. 16.3.10. West Pharmaceutical Service, Inc.
16.3.12. ACG Pharmapack Pvt. Ltd.
16.3.18. Clondalkin Group Holdings B.V.